The United Nations' highest court on Wednesday ordered the United States to lift sanctions on Iran that affect imports of humanitarian goods and products and services linked to the safety of civil aviation. The ruling is legally binding, but it is yet unclear if President Donald Trump's administration will comply. THE HAGUE, Netherlands (AP) — The United Nations’ highest court on Wednesday ordered the United States to lift sanctions on Iran that affect imports of humanitarian goods and products and services linked to civil aviation safety. The ruling by the International Court of Justice is legally binding, but the Trump administration said the U.S. was terminating a decades-old treaty that Iran used as the basis for its case. U.S. Secretary of State Mike Pompeo said withdrawing from the 1955 Treaty of Amity was long overdue and followed Iran “groundlessly” bringing the complaint to the U.N. court. Pompeo said the administration would proceed with sanctions enforcement with existing exceptions for humanitarian and flight safety transactions. “The United States has been actively engaged on these issues without regard to any proceeding before the ICJ,” he said. Meanwhile, U.S. national security adviser John Bolton said the administration also was pulling out of an amendment to the Vienna Convention on Diplomatic Relations that Iran or others, notably the Palestinians, could use to sue the U.S. at The Hague-based tribunal. President Donald Trump moved to restore tough U.S. sanctions against Iran in May after withdrawing from Tehran’s nuclear accord with world powers. 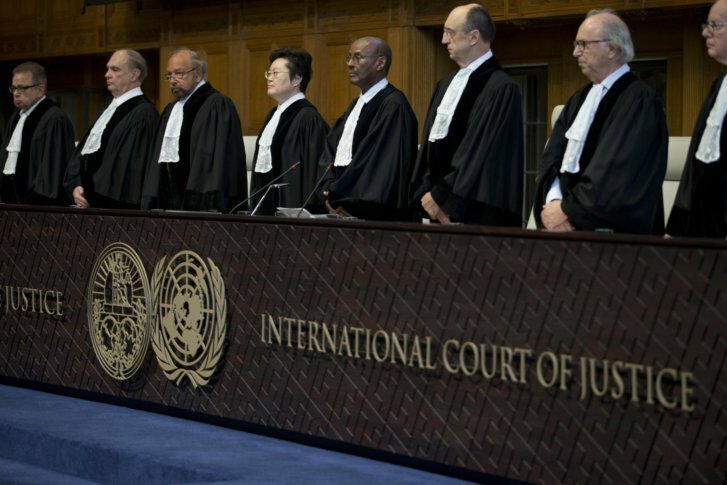 Iran challenged the sanctions in a case filed in July at the International Court of Justice. In a preliminary ruling, the court said that Washington must “remove, by means of its choosing, any impediments arising from” the re-imposition of sanctions to the export to Iran of medicine and medical devices, food and agricultural commodities and spare parts and equipment necessary to ensure the safety of civil aviation. By limiting the order to sanctions covering humanitarian goods and the civil aviation industry, the ruling did not go as far as Iran had requested. The U.S. ambassador to the Netherlands, Peter Hoekstra, pointed that out in a tweet. While imposing the so-called provisional measures, the court’s president, Abdulqawi Ahmed Yusuf, stressed that the case will continue and the United States could still challenge the court’s jurisdiction. No date has been set for further hearings in the case. At hearings in August, Tehran sought the suspension of sanctions while the case challenging their legality is being heard — a process that can take years. U.S. lawyers responded that the sanctions are a legal and justified national security measure that cannot be challenged by Tehran at the world court. The court said that the Trump administration must “ensure that licenses and necessary authorizations are granted” and payments not restricted if they are linked to the humanitarian and aviation goods. U.S. lawyers had told the court that the administration would “use its best endeavors” to look at concerns about humanitarian and aviation related issues caused by the sanctions. But in its written ruling the court said that the American assurances “are not adequate to address fully the humanitarian and safety concerns” raised by Iran. Iran alleges that the sanctions breach the 1955 Treaty of Amity, which regulates and promotes economic and consular ties between the two countries. The treaty was signed when the U.S. and Iran were still allies following the 1953 revolution — fomented by Britain and the U.S. — that ultimately cemented the rule of Shah Mohammad Reza Pahlavi. Diplomatic relations were severed following the 1979 Islamic Revolution in Iran and takeover of the U.S. Embassy and ensuing hostage crisis. However, the treaty had remained in force. Associated Press writer Amir Vahdat in Tehran, Iran, and AP Diplomatic Writer Matthew Lee in Washington, contributed to this report.